This is the ultimate pig-out. 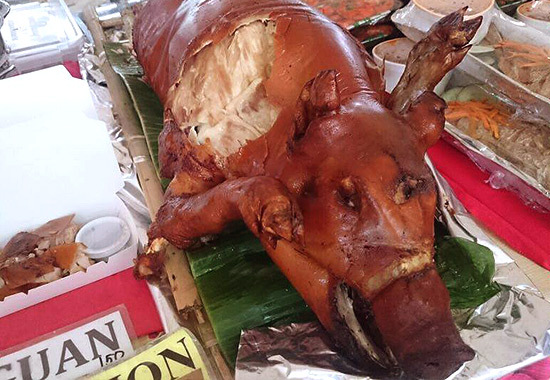 (SPOT.ph) When your table centerpiece is suddenly replaced by a roasted pig, it could only mean one thing: It's officially party time! Take a good look at that glistening skin because once guests start coming in, it'll be gone in minutes. Christmas is never complete without experiencing the glorious crunch and explosion of (delicious) fatty flavors only a lechon can give. We took matters into our own hands (and risked our hearts) and pigged out so we could rank some of the best lechon we could find in Manila. 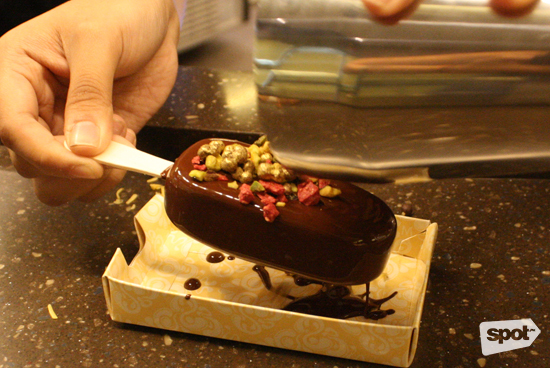 There are three types of people in the world: the balat fans, the fat lovers, and the ones who are after flavor. This list is ranked based on who was able to strike the perfect balance of crunch, fat, and flavor. Editor's note: Porchetta, roast pork belly, and suckling pigs or lechon de leche were not considered for this list. Originally from Lapu-Lapu City in Cebu, Jun and Jun’s put up a stand-alone branch in Bonifacio Global City in 2004 to cater fresh lechon in Manila—now they have three branches in the Metro. Jun and Jun’s offers “Cebu-style” lechon, but they use a top secret technique from Balayan, Batangas, to develop that even, dark brown skin. The crunch, unfortunately, isn't even all throughout. Some parts are slightly rubbery, some are deliciously crisp. The succulent meat, however, gets the saltiness just right. You can leave that sauce on the side. You don’t have to wait for a party to get your lechon fix. Jun and Jun’s serves lechon in small portions: Tinihik (1/4), Buchokoy (1/2), and Gastador (1 kilo).You can indulge in this porky treat without breaking the bank. 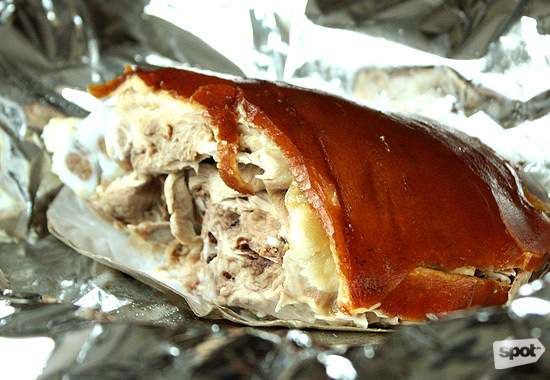 Loring’s Native Lechon (also known as Aling Loring’s) has been serving lechon for 55 years now–since 1960! The lechon has thin, crispy skin—although there are some parts that are not crunchy, with layers of fat underneath that make it oily. The meat has a warm, dark color that's nicely tender. The sweet, peppery gravy is a great complement to the flavorful meat. It’s also worth mentioning that they have a friendly staff, which makes the ordering and delivery process a breeze. 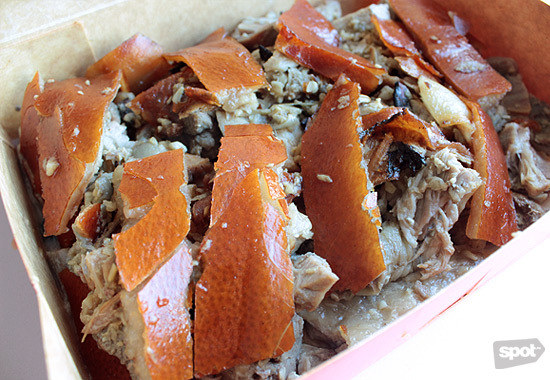 Loring's Native Lechon is at 6 J. Eustaquio corner N. Domingo Streets, San Juan City (0915-642-1544 or 724-2867). 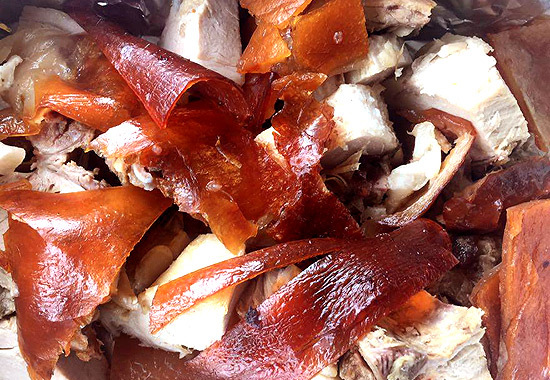 If the pig's balat is your favorite part, you’ll love Ulcing’s Cebu Lechon. The glossy, golden-brown skin shows how evenly Ulcing roasts their lechon—and the thinness only makes the crunch more pronounced. Cooked Cebu-style, the skin is more on the salty side and not too oily. Over 30 years in the business has earned them loyal customers who keep coming back for their roasted pigs. The meat is moist, well-seasoned, and barely requires sauce. Still, your lechon comes with a bottle of Mang Tomas sarsa or they can mix up a vinegar dip at your request. 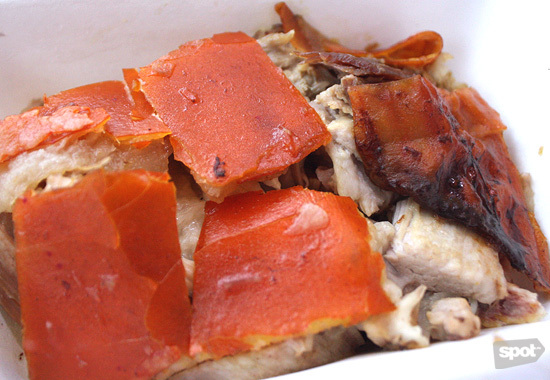 Ulcing's Cebu Lechon is at 22 Bayani Road, Fort Bonifacio, Taguig City (0919-361-3291 or 810-6408). This glistening number boasts a golden skin with shy layers of fat separating it from the tender meat. Cutting through the skin might not result in a glorious crunch that a balat-lover might look for, but it still delivers a crispiness that works nicely against the cushiony fat and savory meat, making each bite a yummy, porky one. There's no need for sarsa here. The meat is succulent and briny, but not to the point that you'll need to water the flavor down. If you're the type to get turned off by stray hairs on the skin, you have to survey your piece before you indulge. Yobob Lechon de Cebu is at Tomas Morato corner Scout Fernandez Quezon, Quezon City (351-7002). If you're not a fan of too much oil, the skin on a Lydia's lechon is the least greasy on the list. Parts of its beautifully brown skin are slightly burnt, giving it a nice flavor that will captivate your taste buds. Even if it has less fat (a great option for the cholesterol-conscious folk), it has the perfect amount of saltiness that seeps into the meat. Dunk each forkful in standard lechon sauce to get the most out of each bite. Eat it quickly, though! The skin can get a little tough if you let it sit for too long. 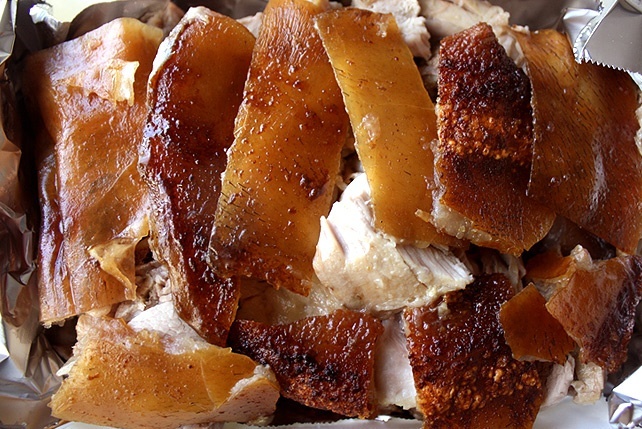 Click here for a list of Lydia's Lechon branches (376-9016, 376-1818, 376-5173). Fat lovers, you're in for a treat. 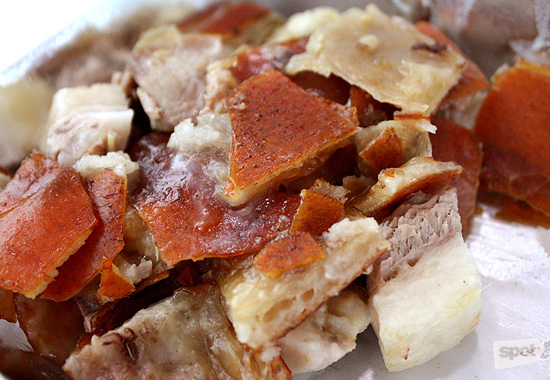 Elarz Lechon's skin is thin and gives a remarkable crunch almost all the time. Underneath the layer of smooth and thin skin is a nice fluffy gift–fatty layers laced with the wonderfully seasoned meat. It's flavorful enough to eat on its own, but the lechon sauce it comes with gives it a different twist—in a yummy way! Jiro sells lechon by the whole so if you’re craving solo, you have to drive to Salcedo Market where they set up shop every Saturday, chopping a pig into individual portions. Make sure to come early. At opening time, the skin is fresh and crisp, the fat hot, luscious and melt-in-your-mouth. Hours later, though the skin loses some of its earlier glory, the salty flavor and juiciness remain. It’s cooked Cebu-style so the meat has enough impact on its own, but you can also enjoy it with sarsa. 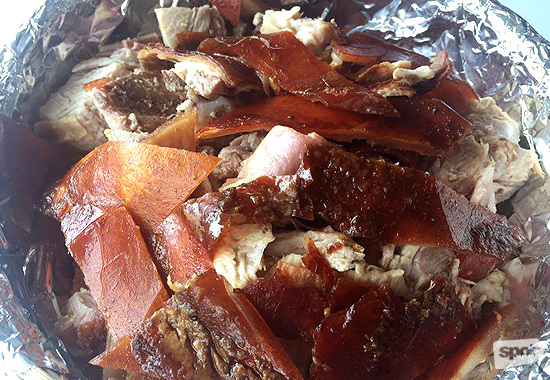 Jiro's Lechon is at Sikatuna Village, Quezon City and at the Salcedo Weekend Market, Salcedo Village, Makati City (433-6298, 433-1261, or 0919-623-8021). Don't let the orangey skin and thick clumps of meat intimidate you. At first glance, one might think that the skin is tough and chewy, but that fairly thick (but still very crunchy! ), smooth skin has a generous layer of fat underneath which results in a wonderful explosion of flavors and textures after one bite. The lean meat is moist and tender with that little hint of saltiness we all love. Take it from us: Enjoy it sans the sauce so you can appreciate its flavor. 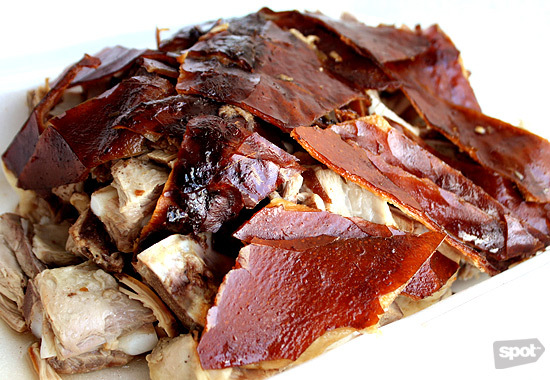 Elar's Lechon is at 151 Quezon Avenue corner Speaker Perez Street, Quezon City (731-7551, 731-7552, 732-4116). 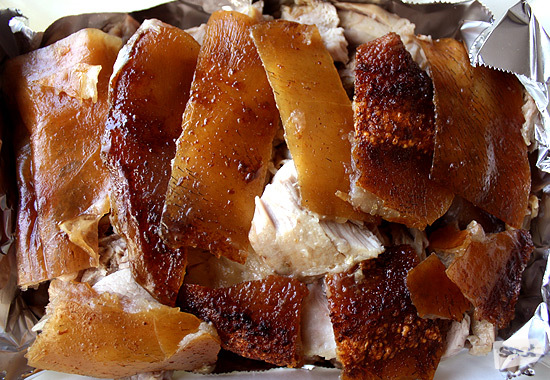 Sabroso's lechon flaunts a perfect golden brown color that's already yummy to look at. That visual tease doesn't disappoint. The skin, crisp and salty, is padded by a generous layer of fat and succulent meat. The skin remains crispy even hours after it was prepared which gives this number extra points. Sabroso uses native pigs that are seasoned with fresh herbs to help give it that distinct flavor. You won't find yourself reaching for that lechon sauce. Sabroso Lechon is at E. Rodriguez Avenue, South Triangle, Quezon City; and Katipunan Avenue, Quezon City (725-0711, 0922-841-6220). 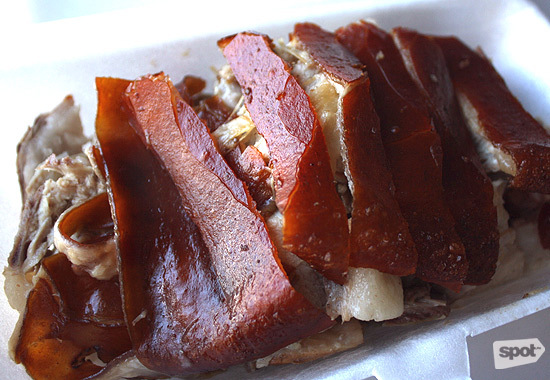 General’s Lechon started in 2007 as a small, home-based business. 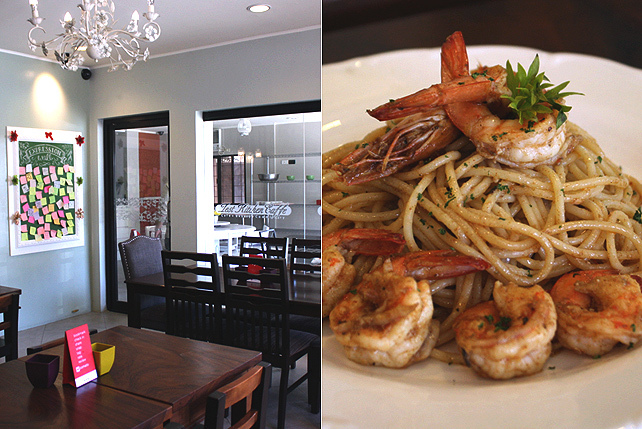 They opened their Makati branch in 2013 so patrons could order by the kilo in a more accessible location. 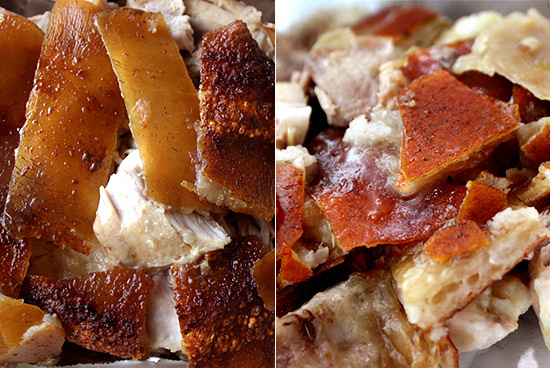 Although new compared to its competitors, it has made its way in the hearts of lechon enthusiasts and foodies. Their lechon is a science and an art in itself—engineering is applied to maintain the consistent flavor of their roasted pigs. Their “Negros-style” lechon is delicately spiced and seasoned with salt, lemongrass, and leeks, among other secret ingredients. The meat is flavorful enough that you wouldn’t mind missing the sauce. The best part is the thin, ultra-crispy skin that makes a pleasant crunchy sound bite after bite. General's Lechon is at 2/F Petron Dasmarinas Village, EDSA corner Arnaiz Avenue, Makati City; 3 Guillermo Street, Ramos Compound, Sun Valley Drive, Paranaque City (408-6850, 0917-704-8070).